In a few short months, I’ve fallen in love with McNally Robinson Booksellers, an indie bookstore located in Grant Park Mall, in Winnipeg, Manitoba, Canada. Call it a long distance friendship, an admiration for a company that understands the value of customer service. 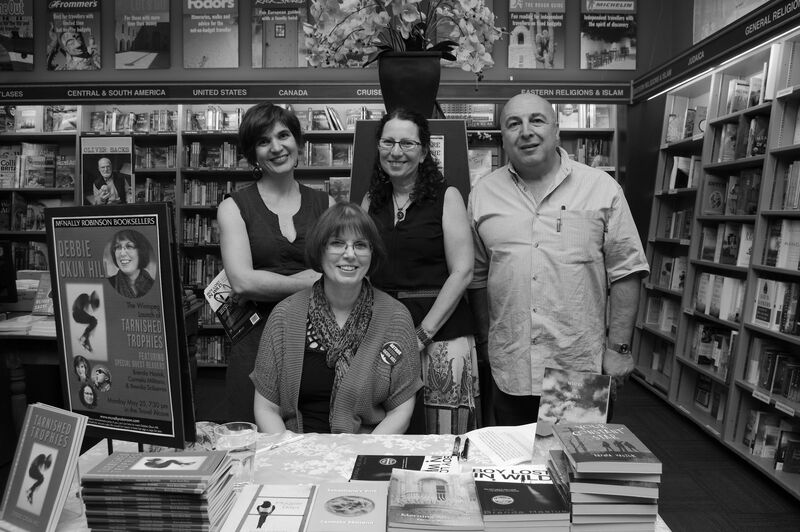 Guest readers Brenda Hasiuk, Brenda Sciberras, and Carmelo Militano with Tarnished Trophies author Debbie Okun Hill during a recent launch celebration at McNally Robinson Booksellers in Winnipeg. Perhaps all indie bookstores have this same charm. The Book Keeper in Sarnia, Ontario certainly works close with its local literary community and the owner Susan Chamberlain often brings in authors from out-of-town. You expect this with smaller centres but I was pleased that the “Friendly Manitoba” license plate slogan extended to this McNally Robinson retail store located in a major Canadian city with a population of over 700,000* people. 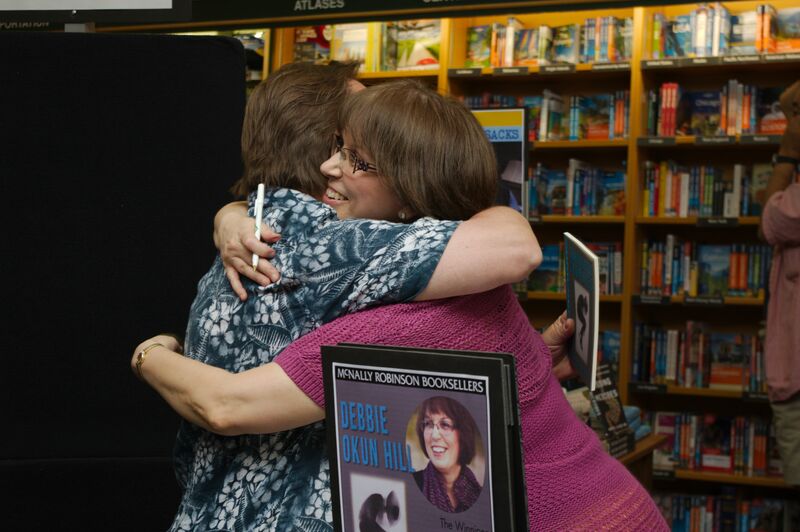 The best part of launching a book in your hometown is seeing friends and family you haven’t seen in a long time. I shouldn’t have been surprised but I had forgotten how warm and rich in spirit this community could be. Yes, I was heading home to my prairie roots where my grandparents sowed potatoes for a living and where I first penned editorials for a high school newspaper. What happened to some of those familiar faces in my yearbook, my university friends who continued on when I took some time off, my college classmates and colleagues I worked with in the public relations field? Like the Red River, memories of smiling friends and relatives flowed through my mind. Many of us still corresponded. Would any of them be interested in a combined reunion/launch/celebration of my first poetry book? When I asked their opinions, the name ‘McNally’ kept rolling off their tongues. I hadn’t considered working with a large bookstore. At first my thoughts circled around a local library or a church hall because many Canadian bookstores don’t carry poetry collections from unknown poets. Selling a poetry book with a sport theme is rather challenging like trying to place a basketball in a hoop when your eyes are glued closed. Not all athletes like poetry. Not all poets like sports. Not everyone wants to wander into arenas to discuss competition, bullying, ageing, and even suicide. However, McNally’s on-line marketing material razzle-dazzled me and the rest is history. Bravo to McNally Robinson’s event coordinator John Toews and his book marketing wizards who did an amazing job. This is what impressed me and this is why I would recommend McNally’s to others. Feel free to use the guidelines for evaluating launch options in other parts of the country. McNally’s has a Winnipeg event coordinator who coordinates almost everything. Talk about placing your trust into someone else’s hands. John Toews was friendly, patient, efficient, organized and a great listener. 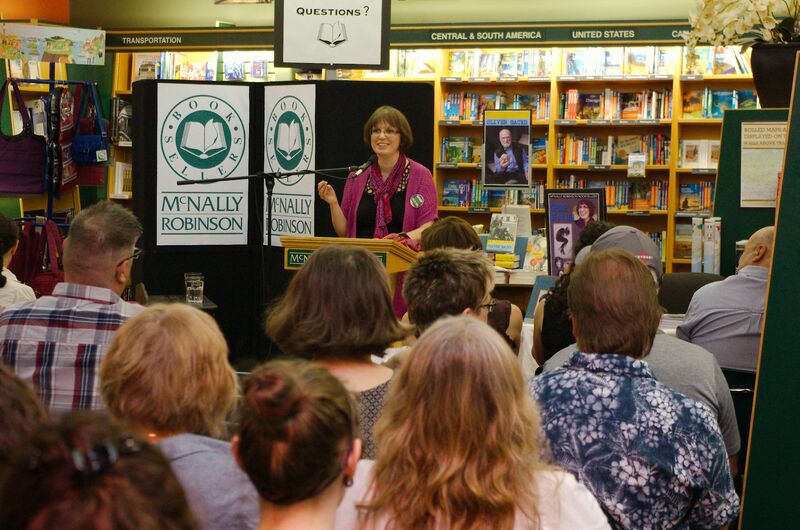 He made you feel like your event was special even though McNally is host to one or two book launches or events a day. They are experienced. If you don’t believe me, see how many events they plan in a week, in a month, in a year. They know the Winnipeg market! When the event coordinator heard I had moved away from Manitoba, he strongly suggested that I find some local writers to read with. This was one of the best suggestions I’d receive. Not only did I meet several local writers in the process but I was equally impressed by the local publisher Turnstone Press as well as Manitoba poet Carmelo Militano who accepted this outsider/stranger and made me feel welcome in this literary community. Check out these Manitoba authors and their books Morning After You, Boy Lost in Wild, and Magpie Days. They started marketing the event immediately! As soon as the launch date was booked, information was posted on McNally’s calendar of events. They are strong social media users. McNally has a large following with over 2900 likes on Facebook and 6300 followers on Twitter. What a great way to communicate with readers. For those who prefer newsletters, they also have an extensive mailing list. They submit promotional material to the media. They have updated contact lists that would take days to prepare if you had to do it yourself. They create posters and book displays. Imagine seeing your event notice posted prominently on their bulletin boards and stacks of your books displayed to customers as soon as they walked into the store. 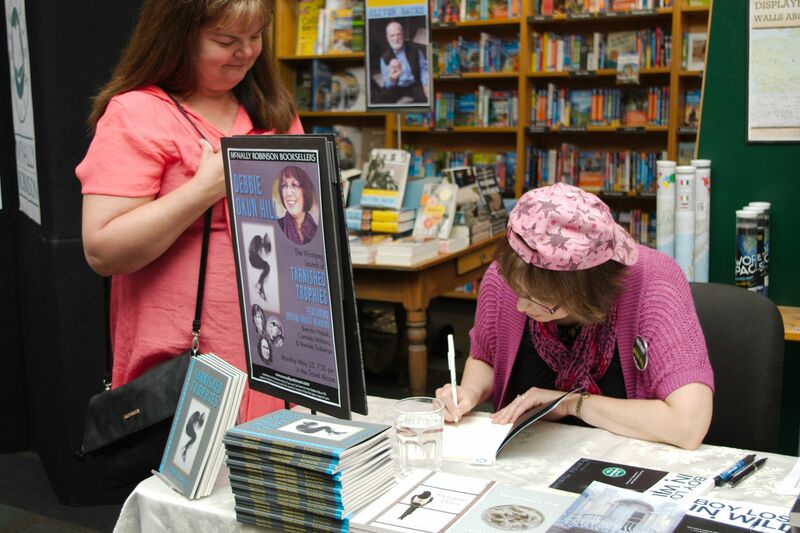 McNally Robinson Booksellers are experts in organizing book signings and readings. They offer catering on location through their in-store restaurant Prairie Ink Restaurant. A variety of food and refreshments are available as an optional feature for your event. They are honest! When I sought advice for food and refreshments, they told me my order was too large. They were right. The portions were generous. Even after downsizing my order, I still had many leftovers which my family enjoyed for days afterwards. They share some of the expenses. Not all services are free, but the cost of a basic plan for the author is minimal ($25) and is good value for all the work that they do. 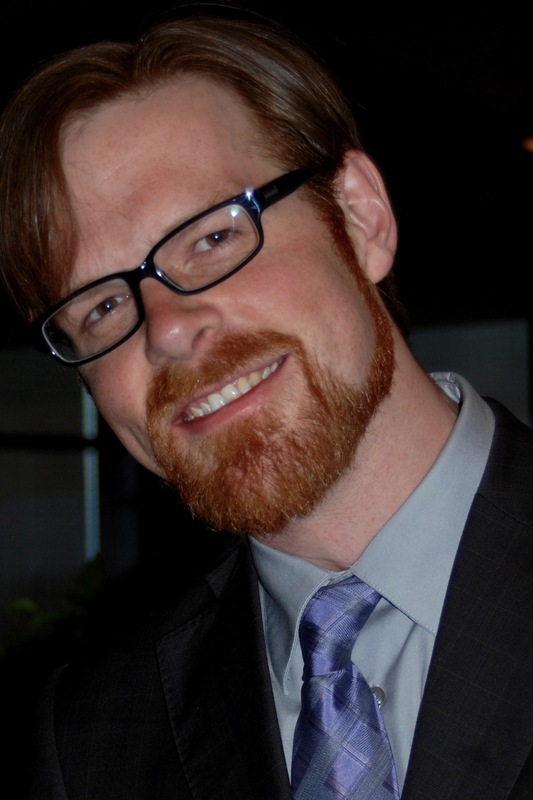 Kristian Enright, author of sonar (Turnstone Press, 2012) was emcee for the May 25 event. Extra help is provided free during the event. Not only do they supply the chairs, mic, podium, signing table, posters, but someone can also be assigned to emcee the event. They pay attention to little details. For example, they provide water for the guest readers and use their company name on the podium as well as logos displayed in a prominent location near the readers. They are team players. They are problem-solvers and work well with numerous personalities. They deliver results! What a nice surprise to not only see family and friends at the event but also strangers in the audience. For me, the smiling faces made it all worth it. McNally’s and my publisher Black Moss Press must have also been happy. 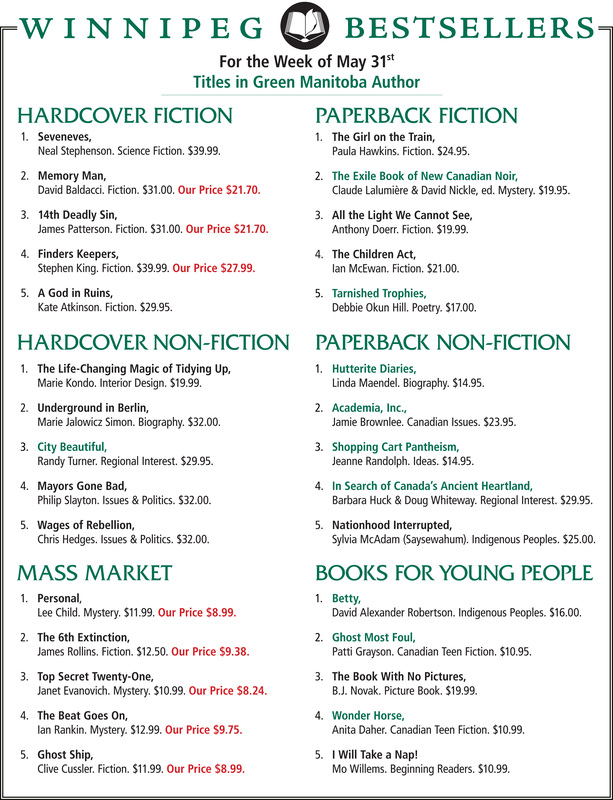 For the week of May 31, 2015 my sport-themed poetry book Tarnished Trophies was ranked fifth in the Paperback Fiction category of McNally’s Winnipeg Bestsellers list. Imagine a poetry book listed in the fiction category!! The Winnipeg launch of Tarnished Trophies (Black Moss Press, 2014) was held Monday, May 25 at McNally Robinson Booksellers, Grant Park Mall, Winnipeg, Manitoba, Canada. For the week of May 31, the book was ranked fifth in the Paperback Fiction category of McNally’s Winnipeg Bestsellers list. Special thanks to McNally Robinson Booksellers and everyone in the audience and behind the scenes who made this Winnipeg launch a highlight of my Manitoba visit! Special thanks to guest readers Brenda H., Brenda S. and Carmelo! Also thank you to my cousin T. G. Holmes who captured so many memories with his cameras. Some of these photos have been displayed on this blog. Others will be shared privately with the guests. If Dorothy (from the Wizard of Oz) played hockey with the Winnipeg Jets, she might have clacked her red skates together and cheered, “There’s no place like home ice”. If she played baseball with the Winnipeg Goldeyes, she might have shouted, “There’s no rush like a home run.” Hmmmm, sometimes it just feels good to be back home in Manitoba. Additional information about the photographer T. G. (Todd) Holmes can be found here. Additional information about the May 25 readers (Brenda Hasiuk, Debbie Okun Hill, Carmelo Militano, and Brenda Sciberras ) and their work and publishers can be found here. 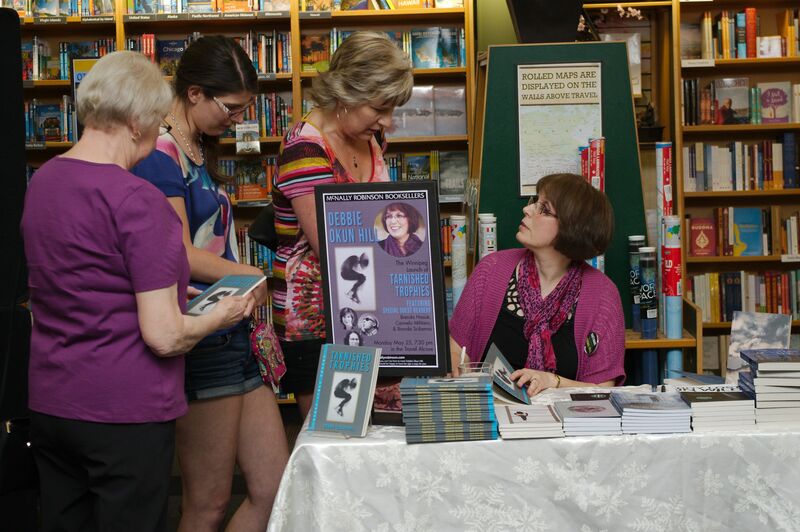 Information about booking an event at McNally Robinson Booksellers can be found here. 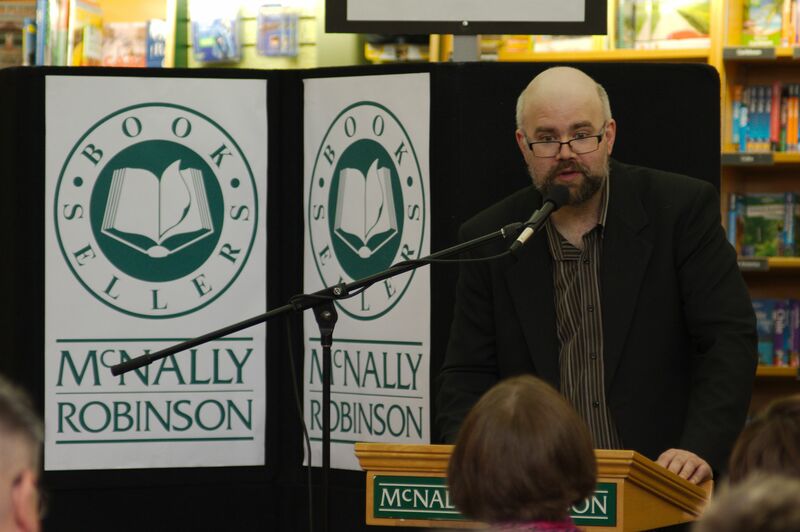 McNally Robinson Booksellers, Grant Park hosts literary events and launches on a regular basis. See here. 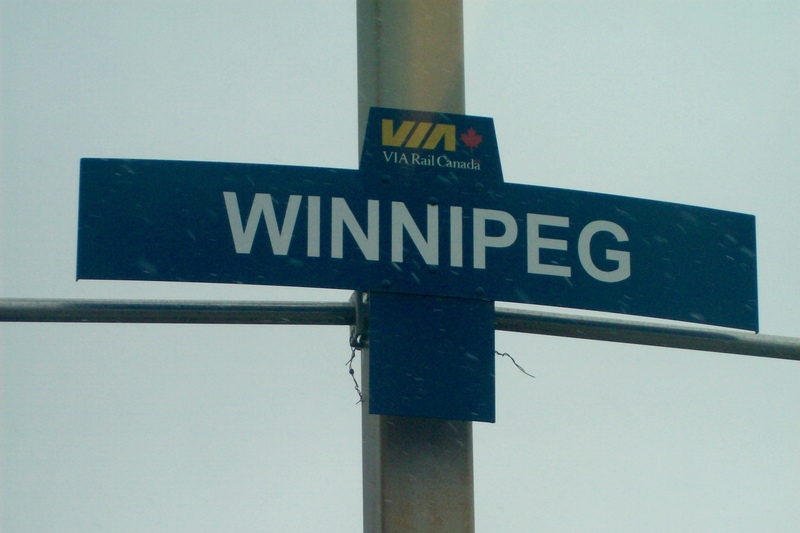 *Population stats prepared by The City of Winnipeg and retrieved from here. 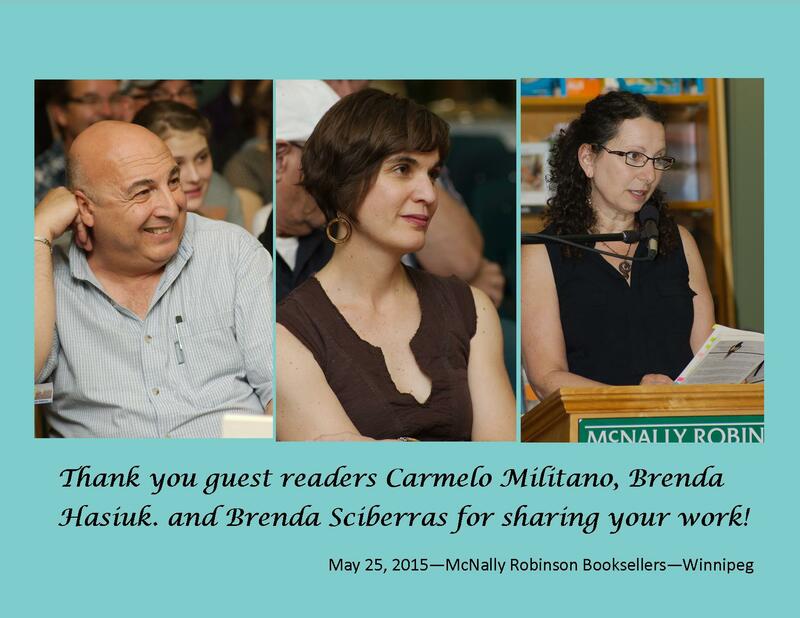 This entry was posted in blog posts, News-Events, Promotional Tips and tagged book launch, Brenda Hasiuk, Brenda Sciberras, Carmelo Militano, Debbie Okun Hill, fiction, McNally Robinson Booksellers, poetry, Winnipeg on June 18, 2015 by d78hill. 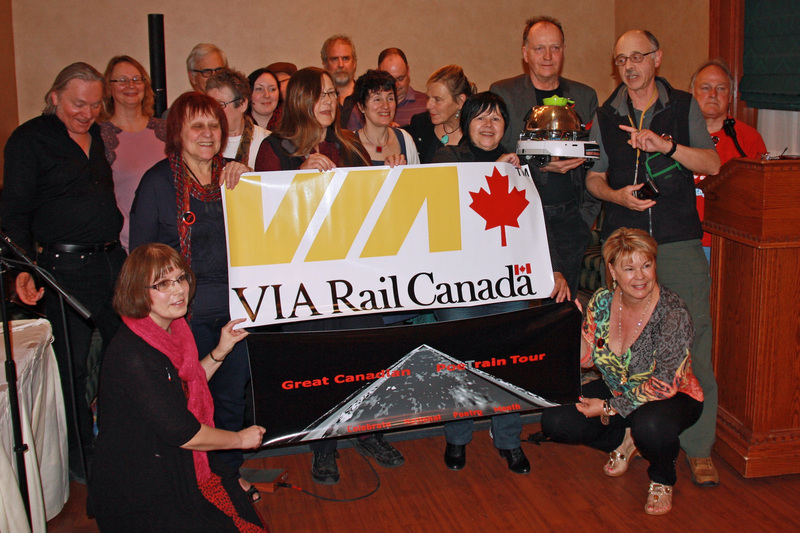 The Great Canadian PoeTrain Tour (Ottawa to Vancouver – April 15 to 26, 2015) was a great success. 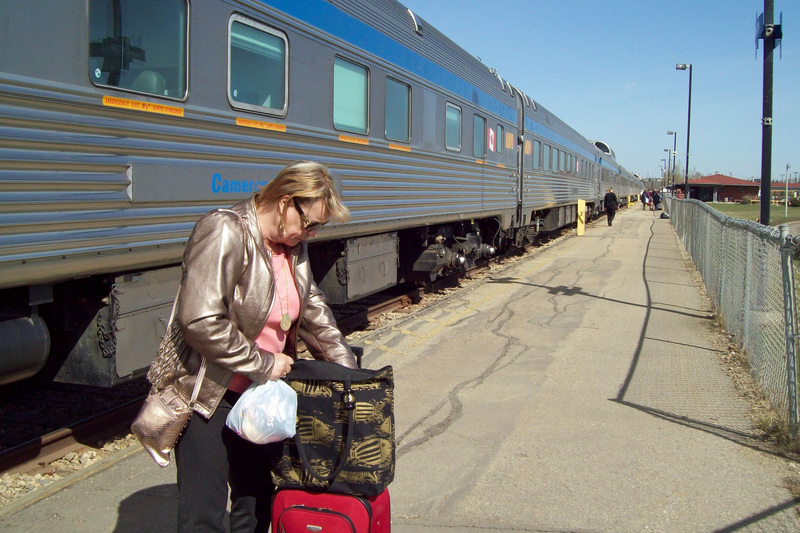 In spite of having to change our travel itinerary in being unable to travel by train to Winnipeg due to derailments and a backlog of freight trains, plus the late train arrivals in Winnipeg and Edmonton, the PoeTrainers adapted showing much patience and flexibility. 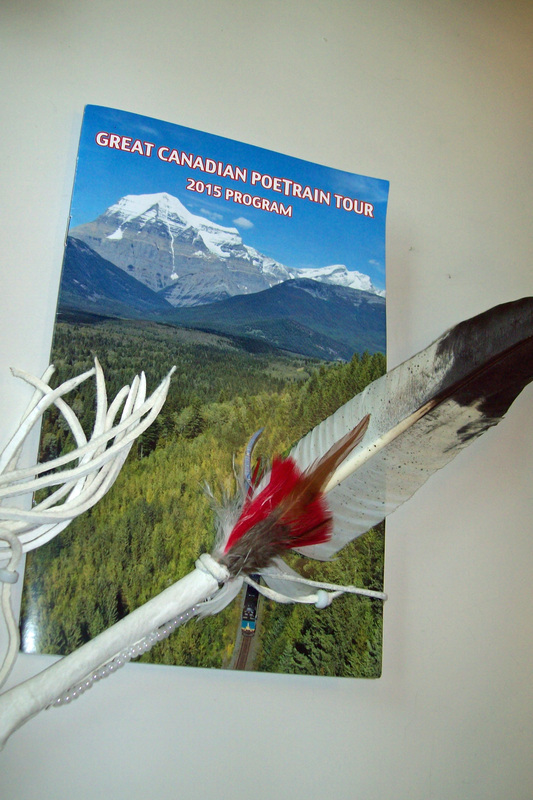 D.C. Reid was the PoeTrain Laureate for the Great Canadian PoeTrain Tour 2015. Our mission/mandate was to travel across Canada to support and stimulate the celebration and promotion of poetry for National Poetry Month. A grand coalition of 22 poets, musicians, and train lovers co-created cultural festivities to engage the general public on and off the train. Key events were organized in Ottawa (Pressed Café), Toronto (Hot House Restaurant & Bar), Winnipeg (Fort Garry Hotel Salon A), Edmonton (Edmonton City Hall), and Vancouver (Café Deux Soleils). These readings enthused local poetry communities along the route to revitalize Spring’s poetic pulse. Joanna Lilley and Kelsey Knight during Marsha Barber’s launch of her new book. (Four poets received Canada Poetry Tour grants thanks to the League of Canadian Poets and the Canada Council for the Arts.) DC Reid passes the talking feather. 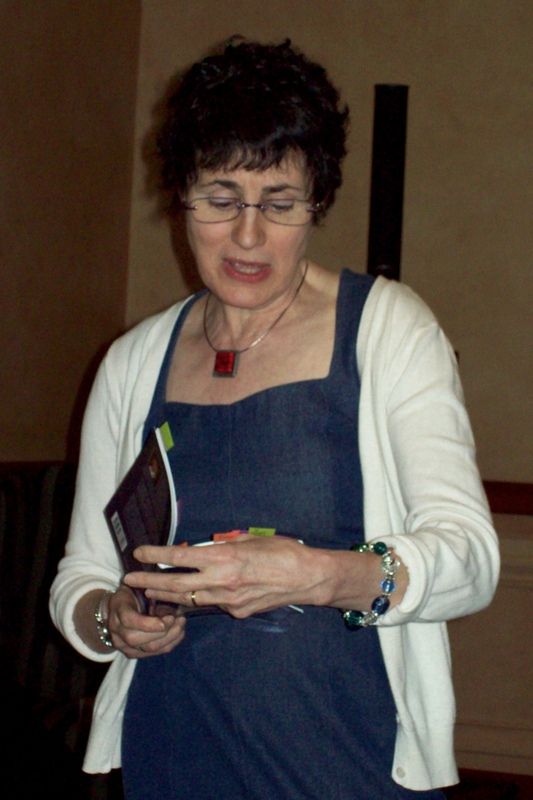 Four past and present Poet Laureates participated in our city stop events. George Elliott Clarke Toronto Poet Laureate, Alice Major Edmonton’s first Poet Laureate, Rachel Rose Vancouver Poet Laureate, and our Parliamentary Poet Laureate Michel Pleau attended our final show in Vancouver. 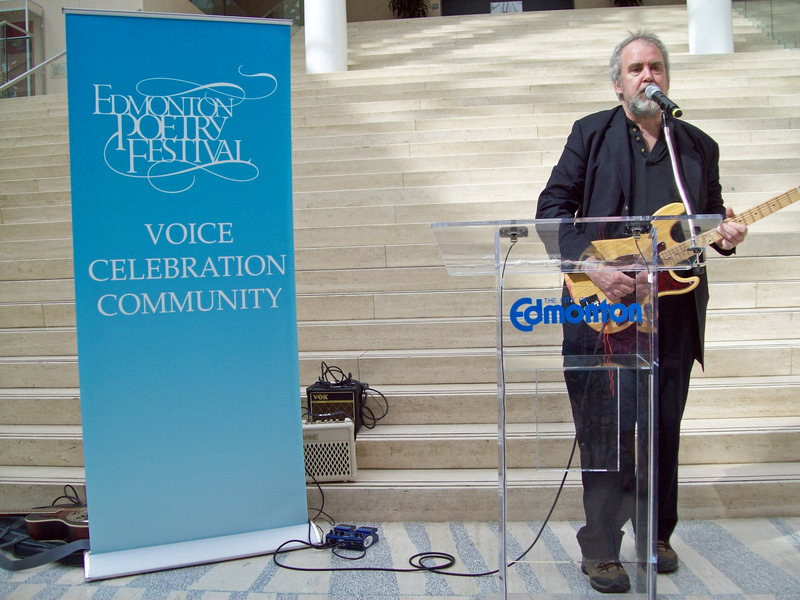 Alice Major, Edmonton’s first poet laureate welcomes the PoeTrainers to the Edmonton Poetry Festival event at City Hall. We met a poet from Nova Scotia Quincy who joined us along with a Via Rail employee who has written every day for the past 10 years. Via’s David shared a couple of poems he wrote specifically for us. Laura Byrne Paquet , an international travel writer who travelled with the group, also reawakened her poetic pulse. In a recent e-mail, she said, “Hi David, It’s taken me a few days to come back to earth after the amazing PoeTrain trip! Thank you SO much for inviting me along. It was one of the memorable trips of my life.” Laura also wrote a haiku saying she had not written poetry since she was sixteen. 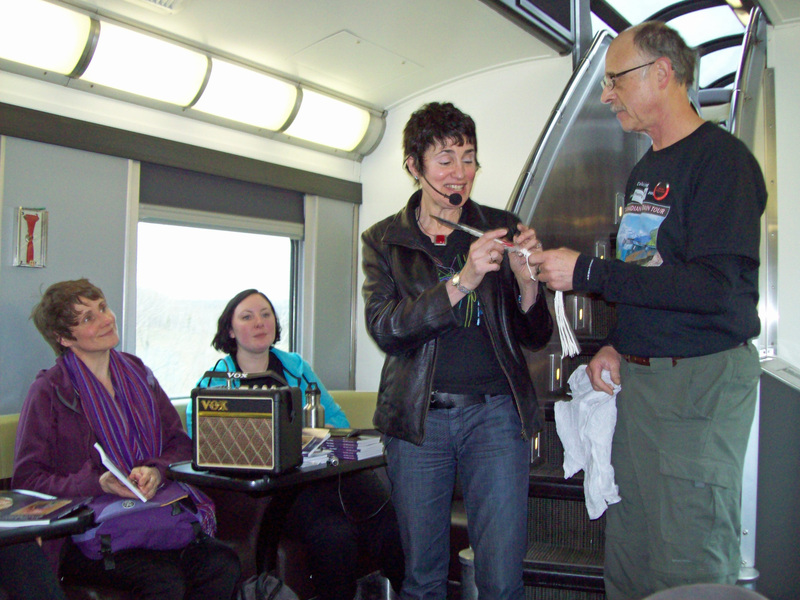 A special thank you to the League of Canadian Poets and the Canada Council for the Arts for providing seven grants including four Canada Reading Tour grants for Blaine Marchand, Marsha Barber, DC Reid, and Debbie Okun Hill to perform/workshop on the train. Also thanks for three food and poetry grants for Blaine Marchand Ottawa, Kathy Figueroa Toronto, and Rachel Rose Vancouver. The food and poetry theme was well integrated into six food inspired event dinners in a private home, cafes, and a final picnic in Stanley Park to honour Pauline Johnson. Kent Bowman, one of the key organizers behind the tour, is seen with the talking feather. DC Reid was our first Poetrain Laureate and carried the talking feather (a symbol of respect for the one who speaks their truth) to events on and off the train. 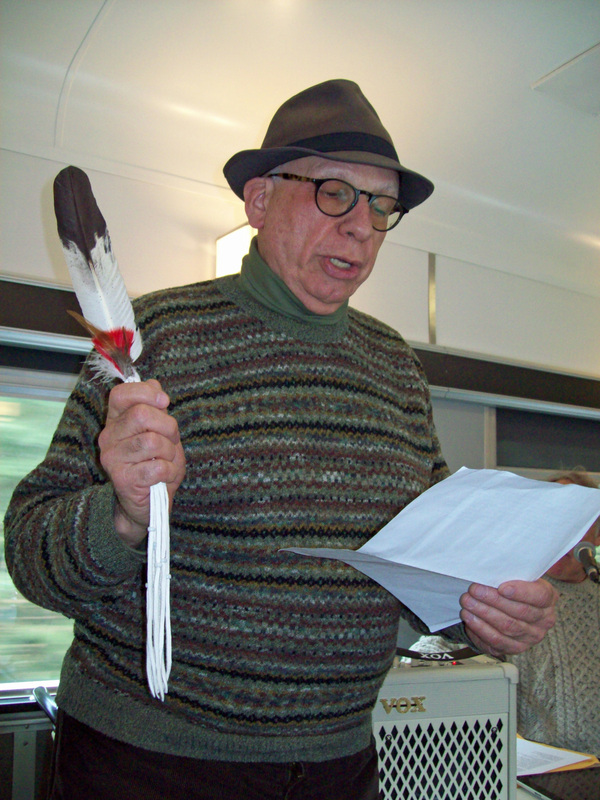 We had Algonquin elder/poet Albert Dumont in Ottawa bless the talking feather before it embarked on its journey. The feather was gifted to hosts in Ottawa Lesley Strutt, Toronto Kate Marshall Flaherty, and Winnipeg Bruce Symaka for Speaking Crow reading series coordinator Chimwemwe Undi, and in Edmonton Alice Major. In Vancouver Bonnie Nish and Kathy Figueroa received the talking feather to take back to their poetry communities. 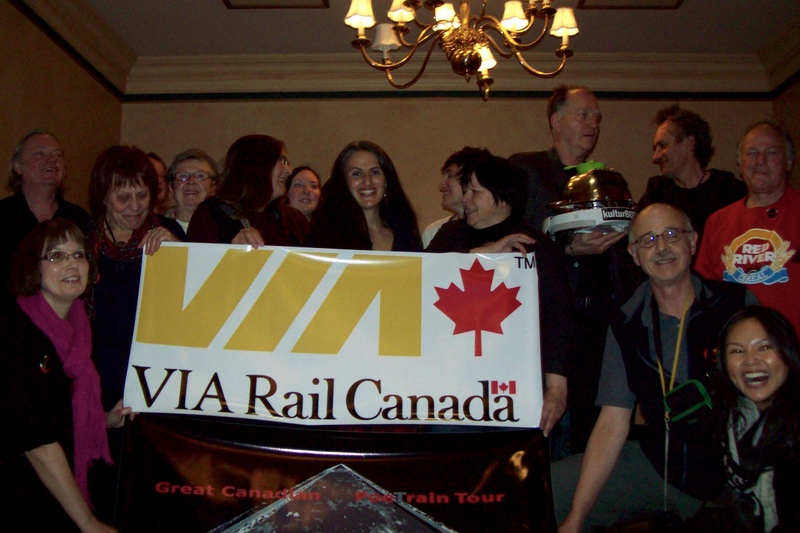 Via Rail Canada provided us with a skyline dome car for our performances, workshops, and music concerts. 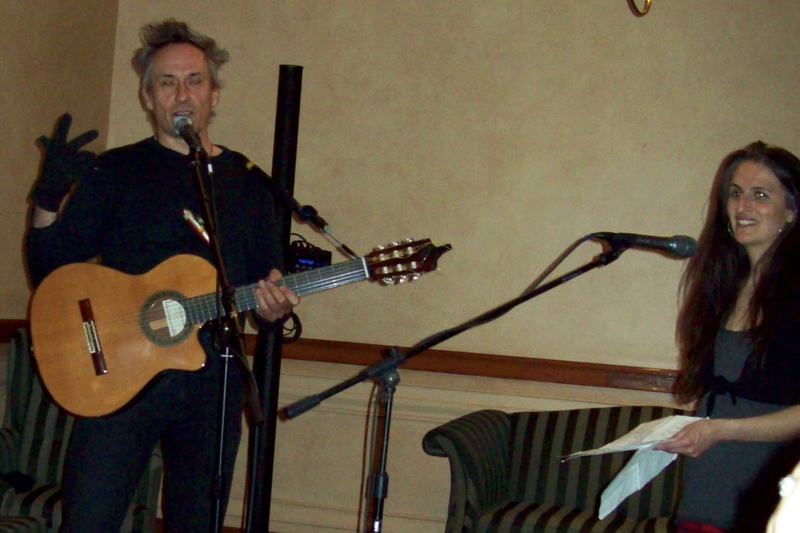 Much gratitude to League members Paul Sanderson and Ian Ferrier for performing for the Artist On Board program. Your great chemistry and musical magic was well enjoyed by all. 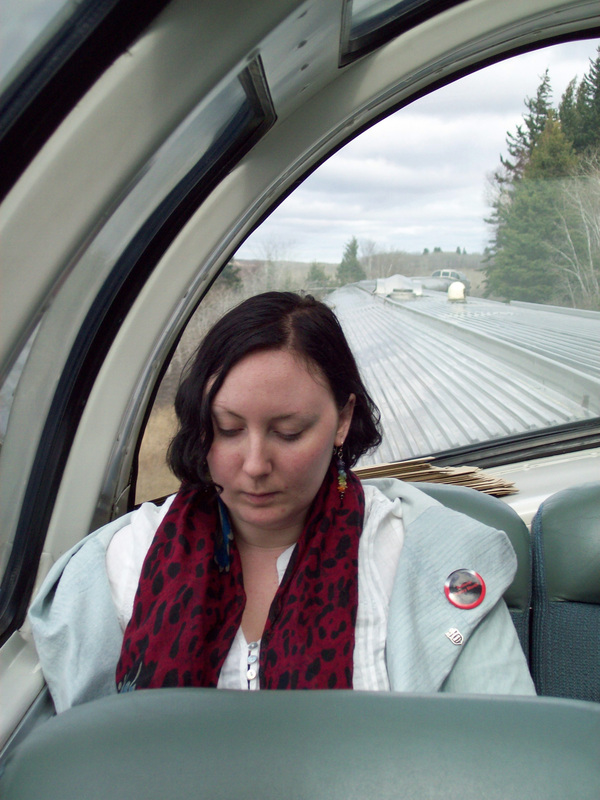 Kelsey Knight reflects in VIA’s Skyline Dome Car. 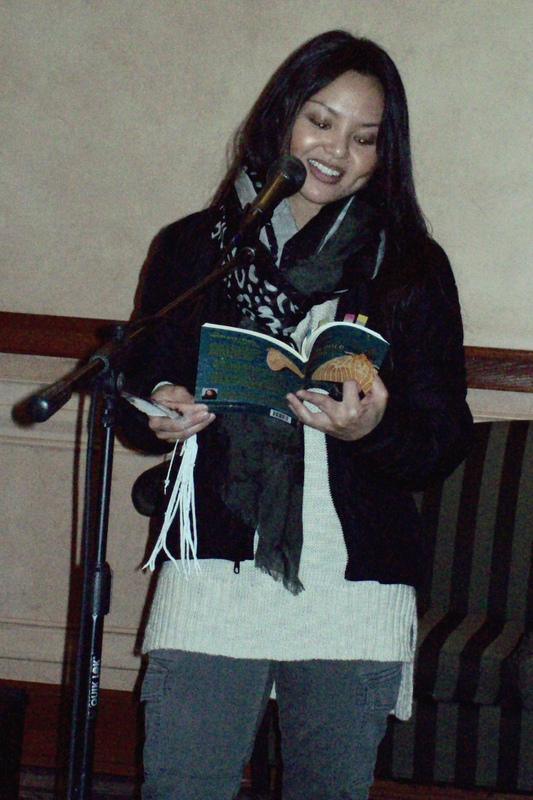 Two publishers participated in providing two League members for readings/book launches on the PoeTrain. Brick Books from Eastern Canada sponsored Joanna Lilley and Western Canada University of Alberta sponsored Ella Zeltserman. Poets, passengers, and the public met the world’s first robot poet my kulturBOT 3.0 co-designed by Ryerson University professor Dr. Frauke Zeller and McMaster University professor Dr. David Harris Smith. 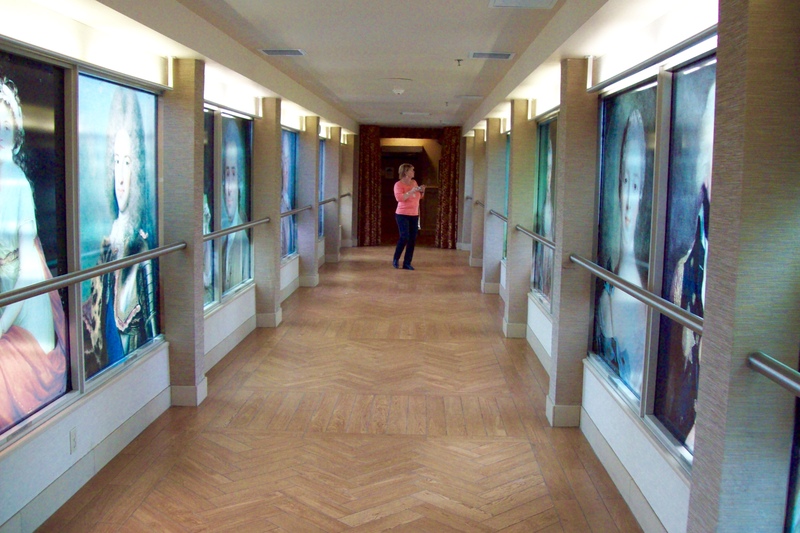 This digitally-savvy guest rode the rails in an inaugural trip. The world’s first robot poet my kulturBOT 3.0 couldn’t talk but would only print out poems connected to the content of the famous explorer David Thompson’s diaries. David Brydges, artistic director for the Great Canadian PoeTrain Tour as well as Pat Connors, one of the key organizers interacts with my kulturBOT 3.0, the world’s first robot poet to ride a train. Several poets and some of the general public read short 100 word poems on and off the train. A social media campaign was organized by Alexandra Pavliuc a Ryerson student who posted photos /videos on www.hitchbot.me . We human poets had fun breathing real life into these whimsical style poems throughout the trip. A poet in Edmonton reading one of the David Thompson diary inspired poems said she liked a phrase and would use it in her next poem. 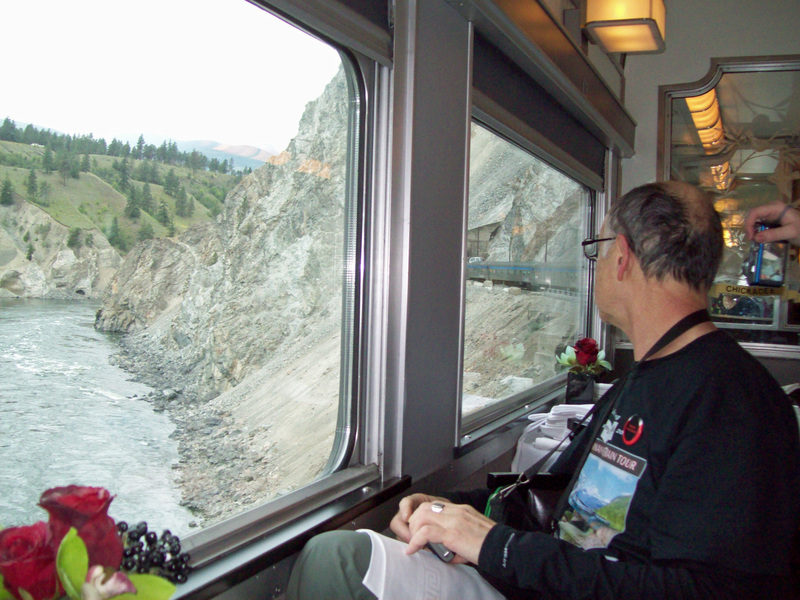 Canadian Poet Blaine Marchand finds inspiration in VIA’s Skyline Dome Car. Kids at the Edmonton train station loved it and had all kinds of suggestions for hats. One guy at the Jasper train station thought the lemon squeezer on top of robot’s head was a tip tray and threw a loonie in as one of the poet/musicians played in front of the BOT. In Vancouver robopoet was seated on a table along with the poets. 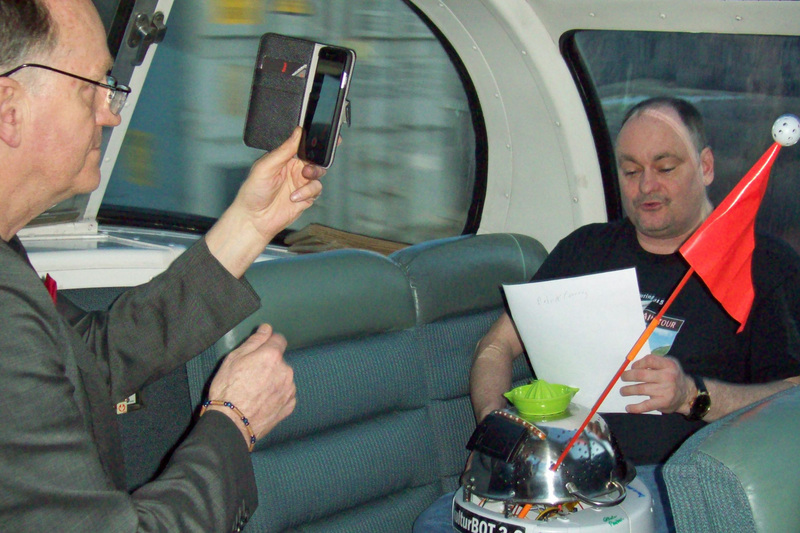 Amusing, entertaining the curious…for when do you have a robot poet attend a poetry event or for that matter travel across Canada on the train? A perfect complement to a most innovative week of poetry celebrations. If a group bonds in community, happiness naturally magnifies. When we begin to serve/dedicate ourselves to the better happiness of others we all prosper. Our collective spirits indeed did shine. Poetry at heart is a pure journey. Special appreciation and thanks to the volunteer organizing team of Kent Bowman, Marsha Barber, Kate Marshall Flaherty, and Patrick Connors. Your go getter and go giver attitude made this a reality of legacy memories. 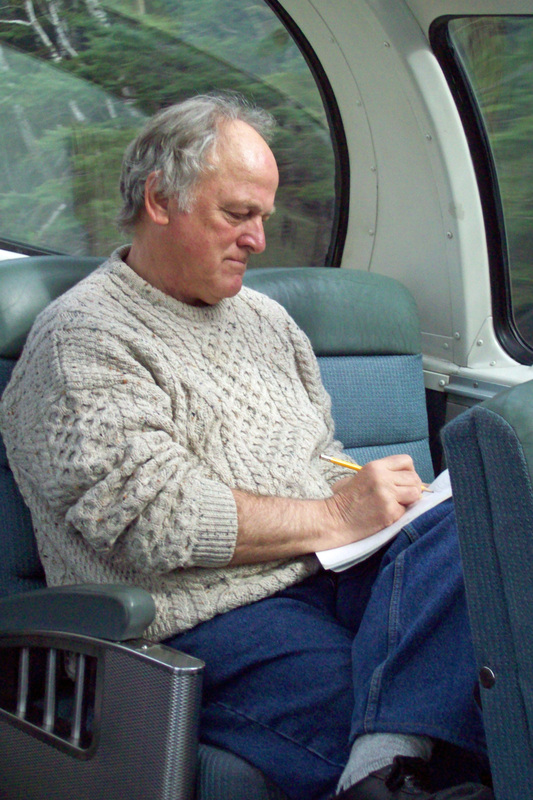 Patrick Connors read a Nik Beat poem throughout the trip as he originally was part of the organizing team but died suddenly in September 2014. Congratulations to the PoeTrainers for keeping the spirit of adventure alive and bonding into a beautiful and epic memory journey. Much poetry was read by the PoeTrainers in each city visited and several open mics on the train. Your diverse and varied voices were an oral mosaic of the Canadian poetic identity. New poetry flowed on the train for a selection of train poems by Canadian poets for an anthology that is to be published shortly. Ian Ferrier performed both off and on the train. A huge thank you to all our 40 sponsors and supporters who generously provided grants, gifted their services, and financial donations. In particular my Vancouver coordinator contact Josephine Wasch Sr Manager, International & Domestic Sales who was highly professional, efficient, and immaculate in helping organize the many moving parts of this PoeTrain project. 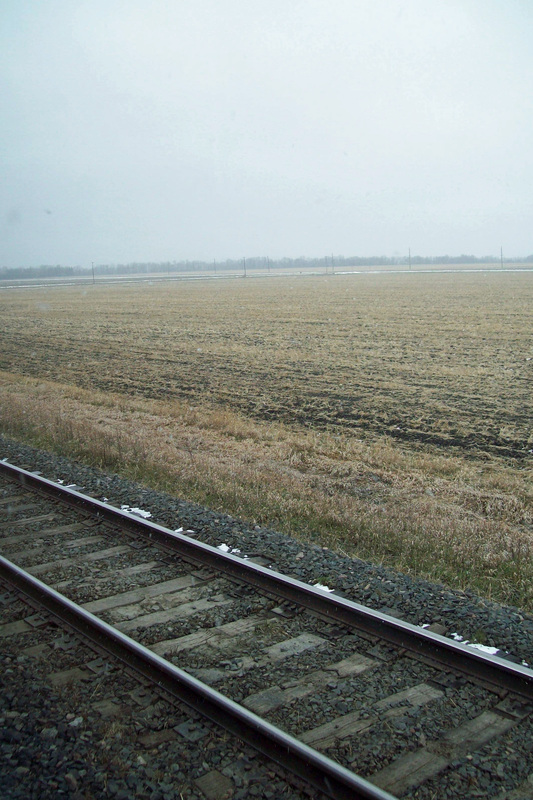 Via Rail provided the complementary Skyline Car between Winnipeg and Edmonton on Tuesday April 21 and again on the final journey between Edmonton and Vancouver on Friday April 24. Paul Sanderson shared music and poetry. VIA Rail sponsored two poet/musicians (Ian Ferrier and Paul Sanderson) to travel on the Canadian, between Toronto and Edmonton, and then Edmonton and Vancouver as part of our Canadian Talent (musician/ poet) Artist On Board program. They entertained passengers in the Park car and in our skyline Car. On the last night they did a special concert for the economy class passengers that was warmly and enthusiastically welcomed. Paul Sanderson also did an impromptu music set at the Jasper station during our short stop. Laura Byrne Paquet was given a complimentary cabin and she blogged, took photos, and is submitting her story of our journey to various travel magazines. 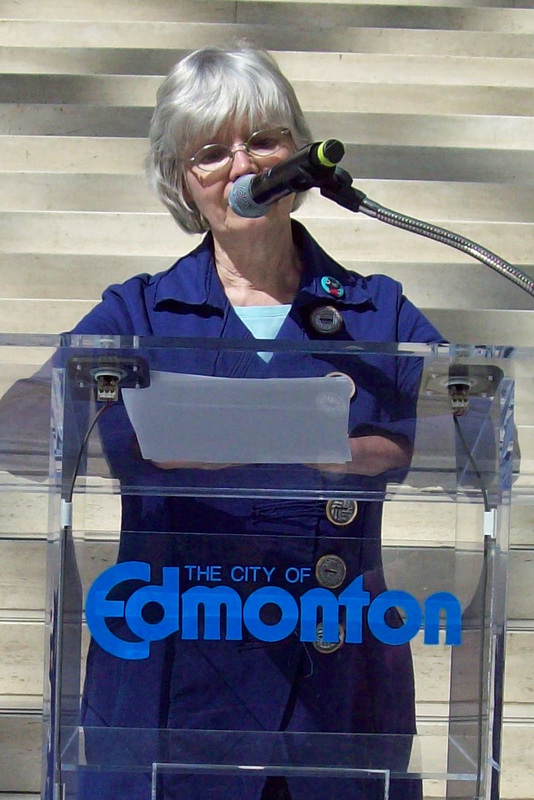 Fran Figge, current President of The Ontario Poetry Society AND Tower Poetry Society, was one of several poets who had never seen the Rockies before but first, a stop in Edmonton. The on board staff at Winnipeg and Edmonton departures were excellent in providing lunch/dinner vouchers for first call which helped us with our on board program. They were continuously supportive throughout the two legs of the trip from Winnipeg to Edmonton and then Edmonton to Vancouver. A big thanks to Michael Wheelen who was commissioned to take photos of the “Canadian” passing the Rockies. We used his photos for our poster, website home page, t-shirt design, official program, and our train poem anthology book cover. 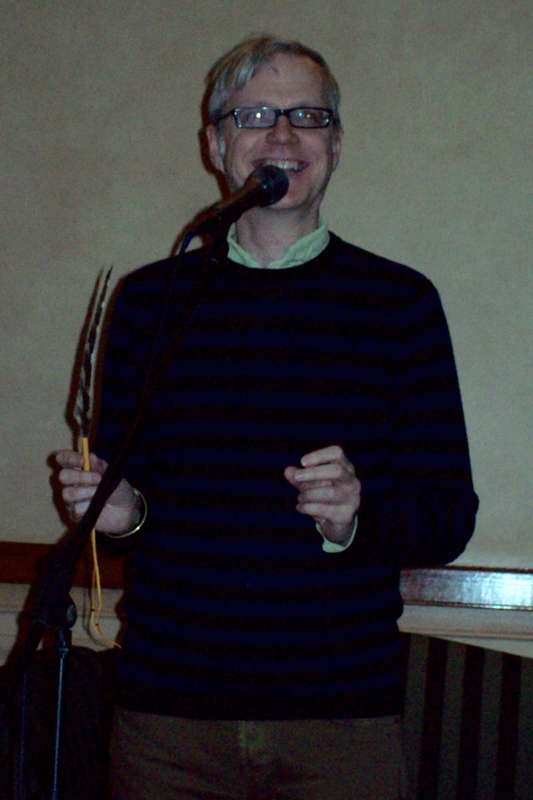 David Brydges is the artistic director of the Great Canadian PoeTrain Tour 2015. A special thank you for his guest blog post. For additional information about the Tour as well as a list of 2015 participants, check the official website here. Previous PoeTrain blog posts appear here , here, and here. Additional photos and comments about the tour will be posted in the near future. 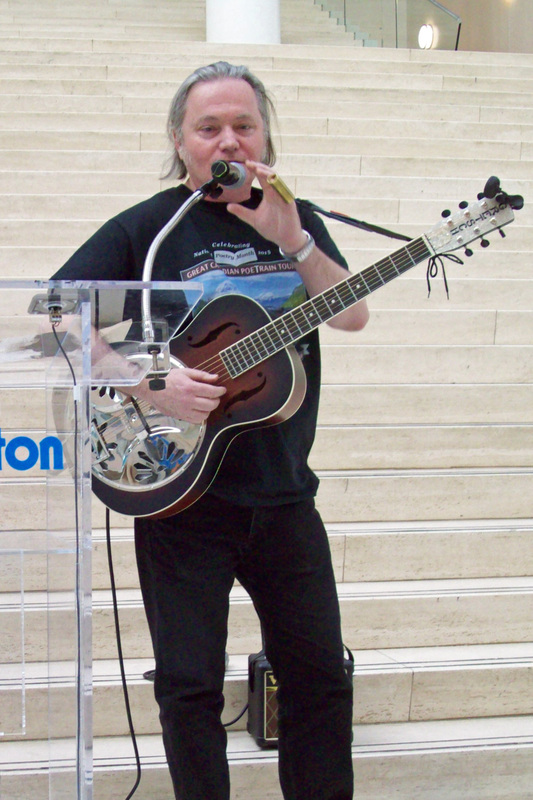 This entry was posted in blog posts, News-Events and tagged Canada Council for the Arts, David Brydges, Edmonton, League of Canadian Poets, Ottawa, PoeTrain, poetry, Toronto, travel, Vancouver, Winnipeg on May 7, 2015 by d78hill.